A settlement in a lawsuit that could delist wolves in Idaho and Montana was proposed last week, but conservationists and congressmen say it's not enough to preempt legislative action. The settlement was reached between 10 conservation groups and the U.S. Department of the Interior, as part of a lawsuit to challenge Interior Secretary Ken Salazar's 2009 decision to remove federal protection from wolves in the Northern Rockies. The decision was mitigated by U.S. District Judge Donald Molloy's August 2010 decision to relist all gray wolves under the Endangered Species Act. However, with legislation in Congress taking aim at the wolf population, and Idaho and Montana's appeal of Molloy's ruling, conservation groups say a settlement was their best option. "It isn't about fighting to the bitter end," said Suzanne Stone, spokeswoman for national advocacy group Defenders of Wildlife. "It's about focusing on constructive management." The settlement would delist wolves in Idaho and Montana, returning wolves to the management of state wildlife departments rather than the U.S. Fish and Wildlife Service, which currently monitors the populations. The service would work with Wyoming to develop a management plan with an eye toward delisting. Wyoming's current proposal classifies wolves as predators, allowing them to be shot on sight. 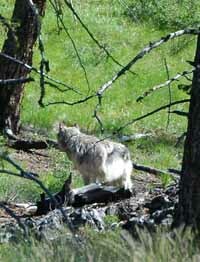 When most of the Northern Rocky Mountain gray wolves were delisted in 2009, Wyoming wolves remained protected. Molloy ruled that endangered species or populations cannot be delisted according to state lines, relisting the entire Northern Rocky Mountain wolf population under the act. The proposed settlement would create a situation very similar to the previous delisting, said Garrick Dutcher, spokesman for Ketchum-based advocacy group Living With Wolves. "I know these groups are doing what they think was best for wolves or the Endangered Species Act, but it's barely different," he said. "How this settlement would benefit wolves is rather vague." Idaho and Montana could set public hunting seasons as early as this fall if the settlement is approved, as well as mitigate livestock depredations and set federally approved population goals. Stone said the main difference is that the settlement requires the service to approve wolf management plans based on the "best available science." The status of wolves in the area would be reviewed by an independent scientific panel every three years. "Politics [can] seep into the science," Stone said. "This will hopefully keep that from happening from all sides and provide for a more pure evaluation." However, the groups involved in the settlement have had to agree not to challenge any final ruling delisting wolves until 2016. "The settlement required compromises on both sides," said Andrew Wetzler, wildlife program manager for the Natural Resources Defense Council, one of the parties in the settlement. "That's always what a settlement entails." Stone said her organization agreed on the settlement to avoid congressional action. "This achieves what everyone was trying to move forward on," she said. "If the settlement moves forward, it replaces the need for congressional action." Dutcher said Congress would likely still attempt to pass delisting legislation, if only for political gain. "Some of the people writing this legislation kind of want their moment of glory," he said. The settlement does not include wolves in Utah, Washington or Oregon, leaving the fate of those smaller populations up to Congress. That omission is the reason the settlement is unlikely to eliminate any legislative action, Dutcher said. "This settlement doesn't come close to appeasing the Utah [congressional] delegation," he said. "I think it's far from over." Rep. Mike Simpson and Sens. Jim Risch and Mike Crapo, all R-Idaho, said last week they are unlikely to back down from their own legislative efforts to exclude wolves from the Endangered Species Act. "The only way to solve this problem is through a legislative delisting of the wolf," Crapo said in a news release last week. "We have recovered the species. It's time to get on common ground and avoid further court actions." Molloy must still approve the settlement before it goes into effect. Though Molloy is expected to hold a hearing Thursday regarding another wolf issue, Wetzler said he wasn't sure when Molloy would be able to rule on the agreement in question. "It's far from done at this point," Stone said.